2005 WCLM - THE YEAR OF THE ELISE! Over 100 Lotus Enthusiasts gathered at the Granlibakken Resort in Tahoe City, Calfornia from June 2-5, 2005 to celebrate Lotus Cars, soak in the Sierra scenery, drive some incredible "Lotus" roads, get in some competition and meet other Lotus enthusiasts. The weather was perfect, the food was fantastic, the love of Lotus beamed from every grin. Nearly a quarter of the 2005 WCLM Entrants came with their new Elise. 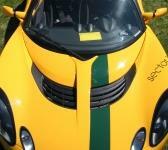 It was clear the Elise as arrived and made the 2005 WCLM "The Year of the Elise". The photos on the 2005 WCLM recap were taken by WCLM participants, Dave Ellis and Festivalofspeed.net. Presented by the Golden Gate Lotus Club in concert with Club Elite, Evergreen Lotus Car Club, Club111, and Lotus Owners of Phoenix. For questions about usage of this site, please refer to our disclaimer statement.